Though admittedly, I was never really a star pupil in school, I am not geographically challenged. I am well aware that Canada is a complete different country than the U.S.A., but I glossed over the "Canadian Comfort Food" in question, and surmised that it pretty much covers a good range of Northern American favorites. 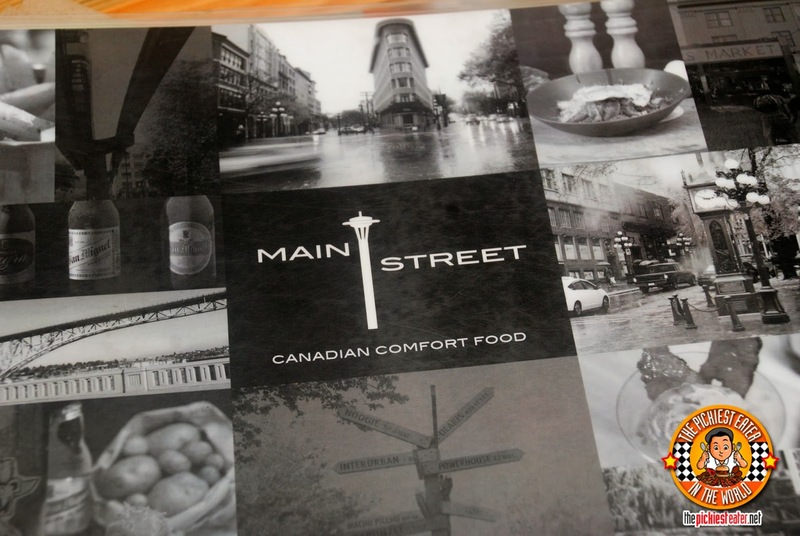 The menu was conceived by Main Street's Managing Partner, Adam Tan. Though Tan had no formal training in the culinary field, he learned quite a few tricks of the trade while working in the kitchen of some of Vancouver's top restaurants. 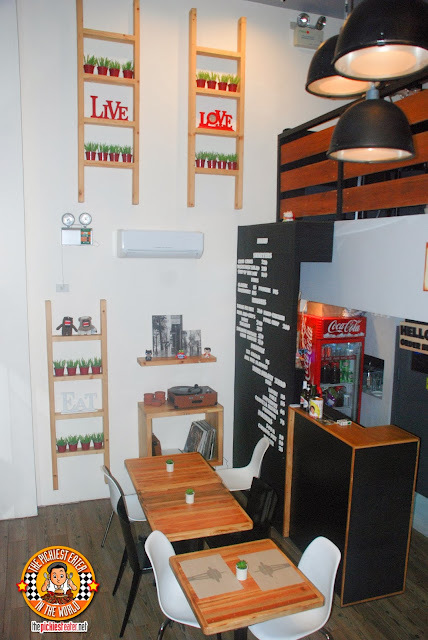 Tan's experience served as the inspiration for this quaint little bistro that he and his partners opened in Tuscany Hill. The relaxed vibe of Main Street makes you feel more in a bachelor's bad than a restaurant. Like most restaurants at Tuscany Hill, Main Street is a loft type layout, with the second floor able to accommodate more tables. Pictures of Vancouver, and several cities in the Northwest mount the walls of the restaurant - but mind you, this is photos taken by friends of the owners - giving a sense or realism, making you feel like you're actually a resident of the city. There’s no way a restaurant could boast that they specialize in Canadian Comfort Food if they get Poutine wrong, and Main Street, nails their Poutine (P145) on the head so hard, it almost squishes it into little bitty pieces. Don't get me wrong, I've never been to Canada so I don't know what actual Poutine tastes like, but whatever version this is, its absolutely delicious. Hand-cut French Fries are deep fried to a crisp, with the wedges then bathed in a rich, Beef Gravy. 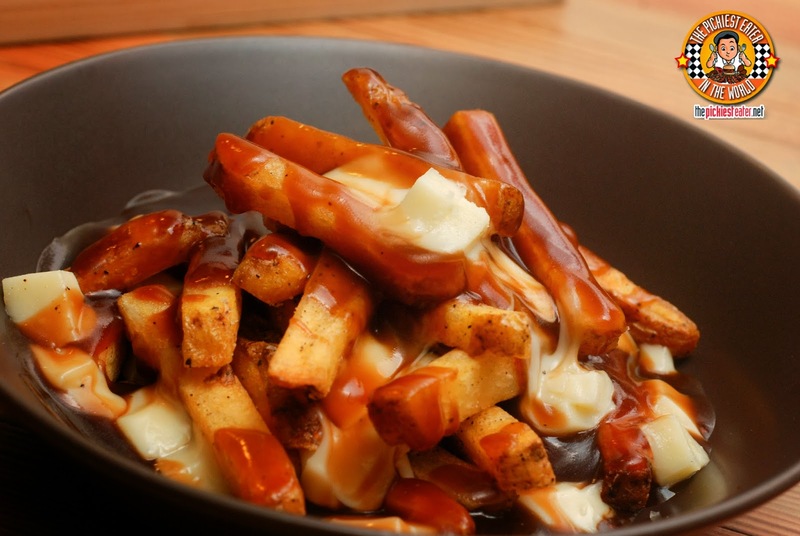 The fries are then topped with cheese curds, that gradually melt themselves into the steaming gravy. I only wish they served this by the bucket. I don't eat crab - with the exception of Crab Cakes. No wait - Let me rephrase. I don't eat crab, unless it's AWESOME Crab Cakes. 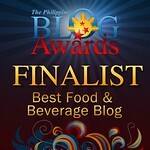 And Main Street's Crab Cakes (P220) qualifies, with flying colors. You could taste the freshness of the lump crab meat ensconced between its perfectly fried golden bread coating. 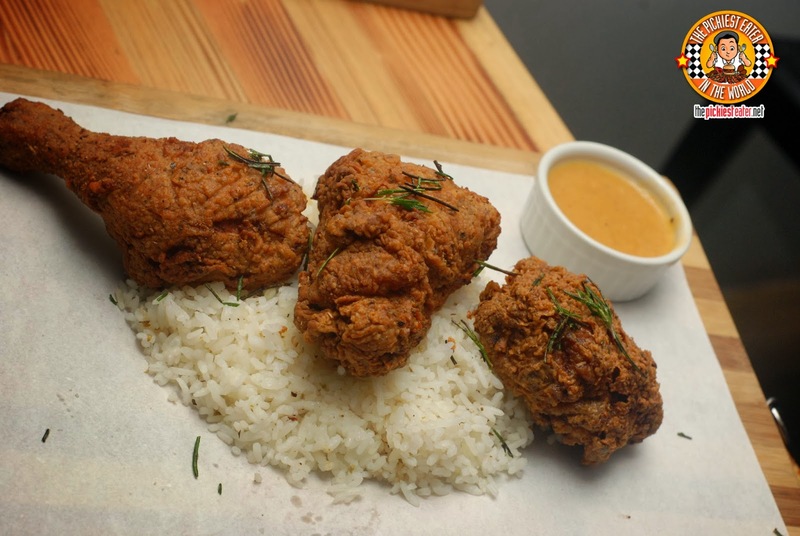 The breading gives off a delicate crunch as you bite in, yet is light enough to ensure the crab meat is the star of this show. 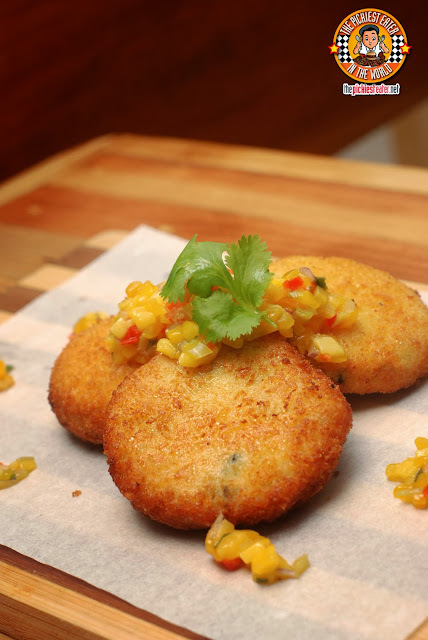 The dish consists of three plump Crab Cakes that pairs wonderfully with the mango salsa garnish. 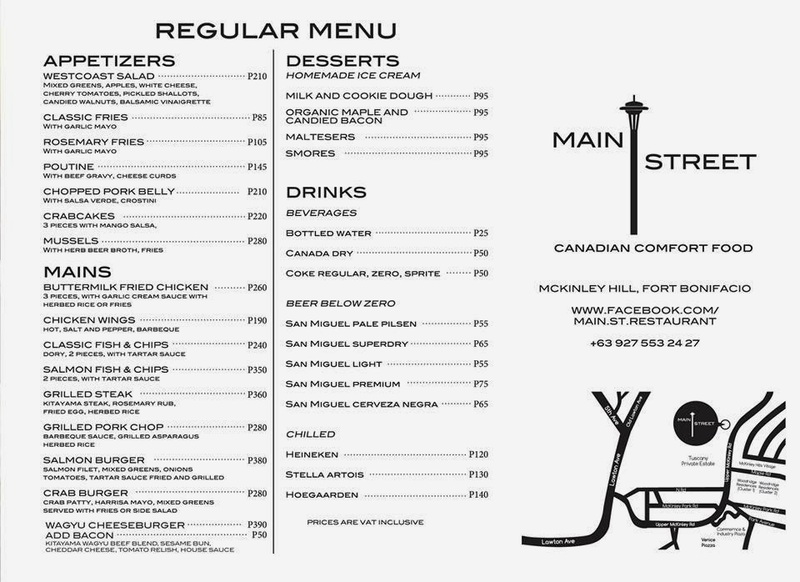 What I found a tad strange was the combination of French Fries and Mussels in the Mussels (P280) of Main Street. Although it does seem like an odd pairing, Adam explained that it is a very popular appetizer in Canada because of the French influence. 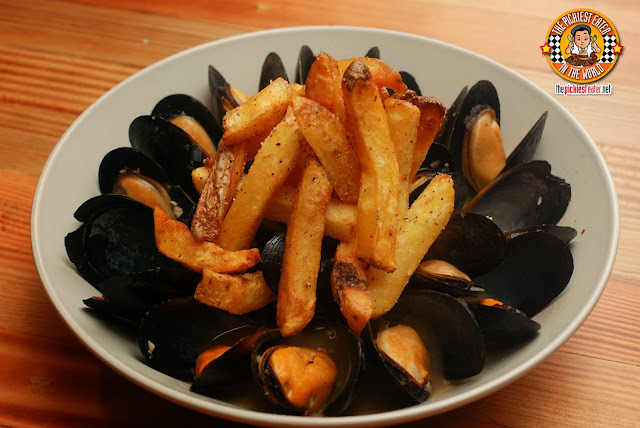 The mussels itself were extremely fresh and with the beer broth bringing out its flavor. The fries are added for a little crunch.. and let's face it, dishes are more fun with French Fries! 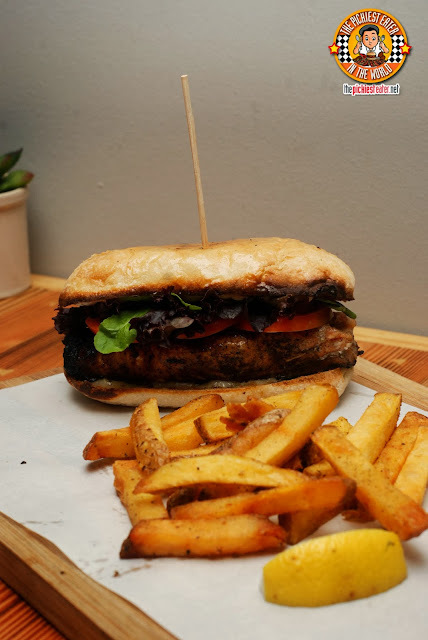 If you're considering ordering the Salmon Burger (P380) because you were in the mood for "something light", you will be terribly mistaken. Because this Salmon-meat behemoth is anything BUT light. With its thick, juicy patty, the slew of vegetables inside it, It's a hearty meal in itself. Something to take note of, is how mind-blowingly good the bread is. Not sure if it was a Ciabatta, but the edges had a bit of a burn, given it a bit of a crunch, but the texture of the bread itself was incredibly soft. 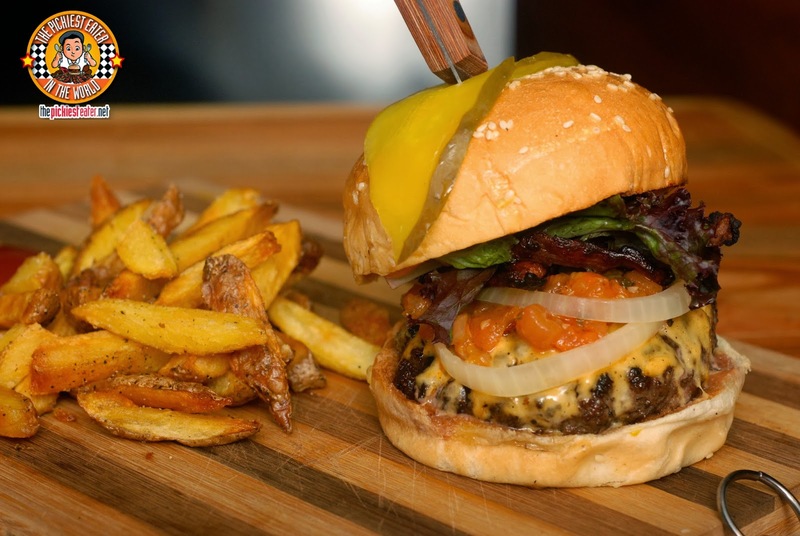 If you're looking for a full on burger, you could also go for Main Street's Wagyu Cheeseburger (P390). Made with a Kitayama Beef Blend Patty, the burger also includes melted Cheddar Cheese, tomato relish, and Main Street's House sauce, all nestled within a toasted sesame seed bun. 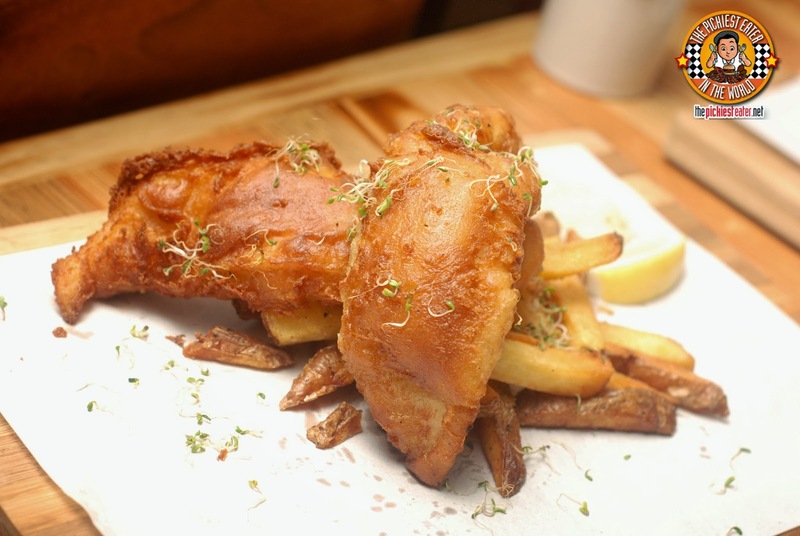 Another delicious entree we tried was the Classic Fish and Chips (P240). Two chunky cuts of Dory, breaded in a seasoned batter, and fried perfectly, laid out on a bed of crispy French Fries. The crunchy coating, when cut into, revealed the immaculately cooked fish meat, that paired beautifully with the tartar sauce. Two pieces of Dory may not sound like much, but the pieces are actually quite large, when eaten with the potatoes, you would find it very filling. Canadian Comfort Food may be the theme of the restaurant, but let's face it, we are in the Philippines, and a great majority of us Pinoys look for rice with their meals. Good thing Main Street came prepared. A good start would definitely have to be the Grilled Steak (P360). 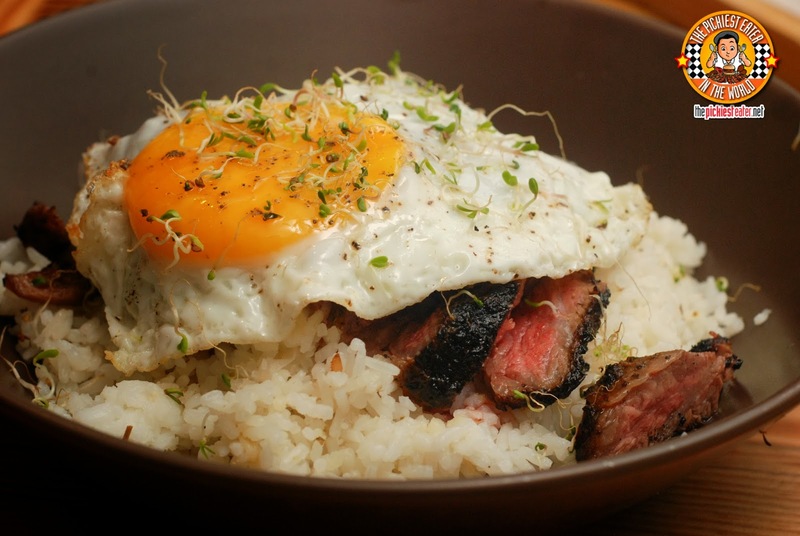 Thin slices of stunning Kitayama Steak, rubbed delicately with Rosemary herbs lying on a bed of Main Street's herbed rice, and topped off with a sunny side up egg. The steak had a wonderful char around its edges yet the center of it was cooked to a nice pink, with trimmings of fat, laced around it. I had an officemate that loved fried chicken so much, when he farted, feathers came out. When he woke up in the morning, instead of a yawn coming out, he went "Cockadoodle-doo!!". I have no doubt in my mind that he would go insane over Main Street's Butter Milk Fried Chicken (P260). The coating was crunchy and had a distinct herby-creaminess to it that complemented the juicy chicken meat. The flavor was further enhanced by the Garlic Cream Sauce that came on the side. You may opt to have this with French Fries, but lets face it.. This goes perfectly with rice. 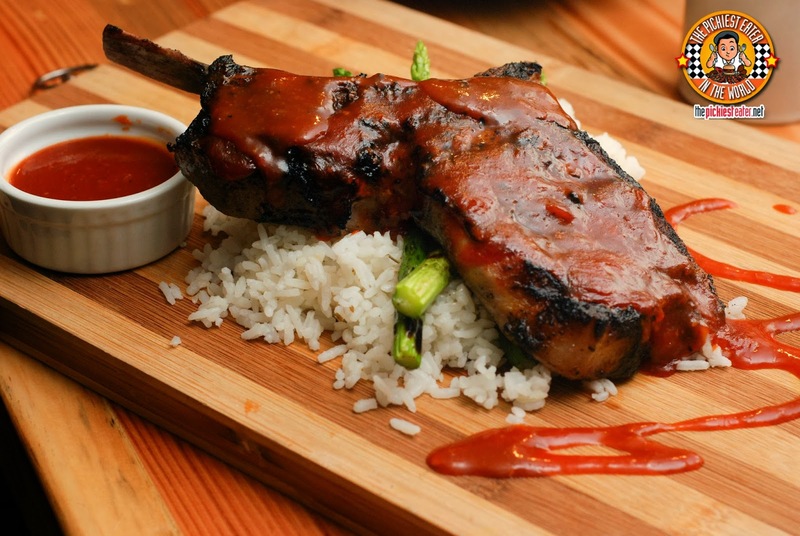 The Grilled Chop (P280) is pretty much the granddaddy of all Pork Chops. This was Chop was so huge, the pig it came from was most likely the starting center for its team in the inter-piggery basketball league. The thick, bone-in chop had a delicious caramelization around the charred edges that I look for in a good grilled pork chop, yet the meat itself remained juicy. The thick BBQ sauce had a mouthwatering sweet, yet tangy taste to it that matched the natural flavor of the pork. 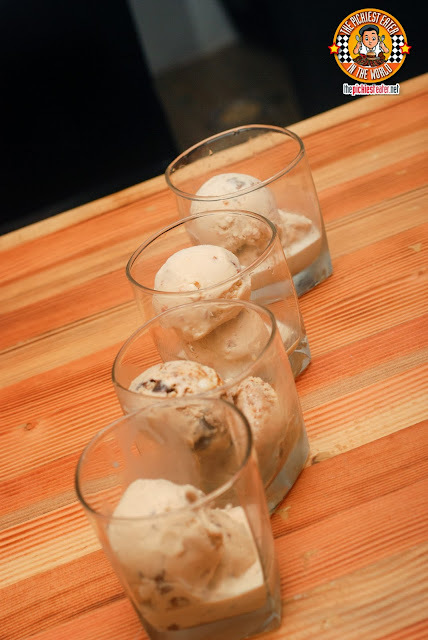 My visit to Main Street was a great introduction to the foodie heaven that is Tuscany Hill. There are so many restaurants there just waiting to be discovered, and with its very reasonable prices and delicious food, Main Street is definitely among the main attractions! We gotta seriously food trip soon, buddy. I've been reading your blog, and dang, You've been everywhere!